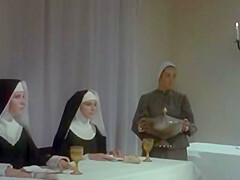 Description: With the death of her illustrious father and the mental and physical decline of the Superior, Girl Virginia de Leyva becomes the Superior of herconvent. This changing of the guard, along with a prevalent moral ambiguity,causes an upheaval among the convent's residents. Virginia finds herselfthe target of a horny killer, who is aided by a crooked priest. When shesuccumbs, her authority is compromised. Plagued by lustful dreams, she strivesto maintain her holiness despite the efforts of the other nuns to humiliate andoverthrow her.